Simple and powerful tool to convert your CR2s.Optimized for multi-core processors Speed up your conversions by using 100% of your CPU. Get one year of update protection and technical support with the purchase of a license. Contenta CR2 Converter will convert and process your CR2s in batch. Contenta CR2 Converter works at the press of a button! Your photos are soon ready to be archived, mailed or published. 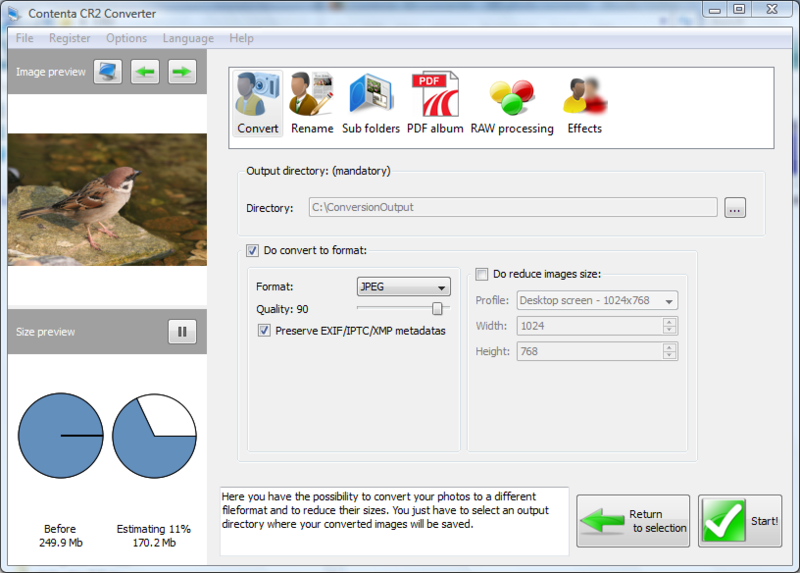 Batch convert your photos. Automatically rename and organize into sub-folders. Qweas is providing links to Contenta CR2 Converter 5.8 as a courtesy, and makes no representations regarding Contenta CR2 Converter or any other applications or any information related thereto. Any questions, complaints or claims regarding this application Contenta CR2 Converter 5.8 must be directed to the appropriate software vendor. You may click the publisher link of Contenta CR2 Converter on the top of this page to get more details about the vendor.